Three McDonough siblings pictured with their spouses? 0 Comments Published by Jane on Sunday, March 07, 2010 at 10:13 PM. Dianne Dowd sent along another photo from her collection today. 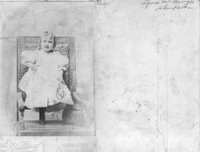 The photo appears to be from the 1890's and pictured may be Bartholomew McDonough, Michael Brennan, and Martin McDonough. Seated in front of the three men are likely their wives - Margaret Fay, Bridget McDonough, and Maria Simmonds. While the photo is not marked, Dianne made the identification after looking at other known photos. I have posted one of Dianne & Tom Dowd's photos of Bartholomew and the shorter man in this photo does resemble him. Thank you again Dianne & Tom for sharing another great old photo! 2 Comments Published by Jane on Monday, May 04, 2009 at 8:34 PM. 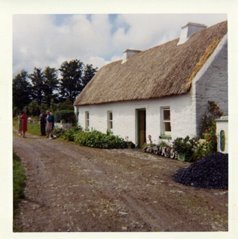 Among the items in the Dowd Collection was this photo of a thatched roofed home located somewhere in the county of Roscommon, Ireland. 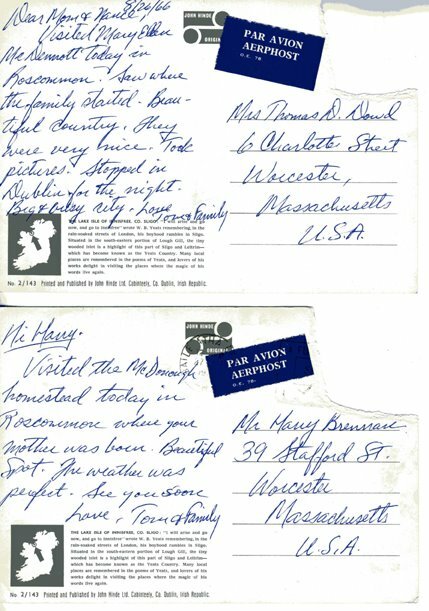 In 1966 the Dowd family visited Ireland and located the McDonough homestead. Along with this picture were others on 35mm slides. The slides are a series of images of the house, the surrounding views of the countryside from the farm, and images taken along the road leading to or from the farm. Unfortunately, while scanning the slides I experienced some technical difficulties. I have other images of the home and farmstead to share in future posts, but one image in particular I am missing - a photo of a sign post which must be near the old McDonough farm. While I am missing the image, I do have the information on the sign. If you click on the map above to view larger, you will see that I have found and circled three of the four locations from the sign. 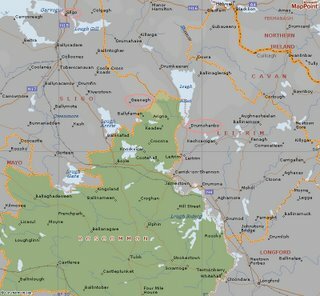 It appears that the most likely area of Roscommon that the farm is located is in the Northern area and near the Sligo boarder. 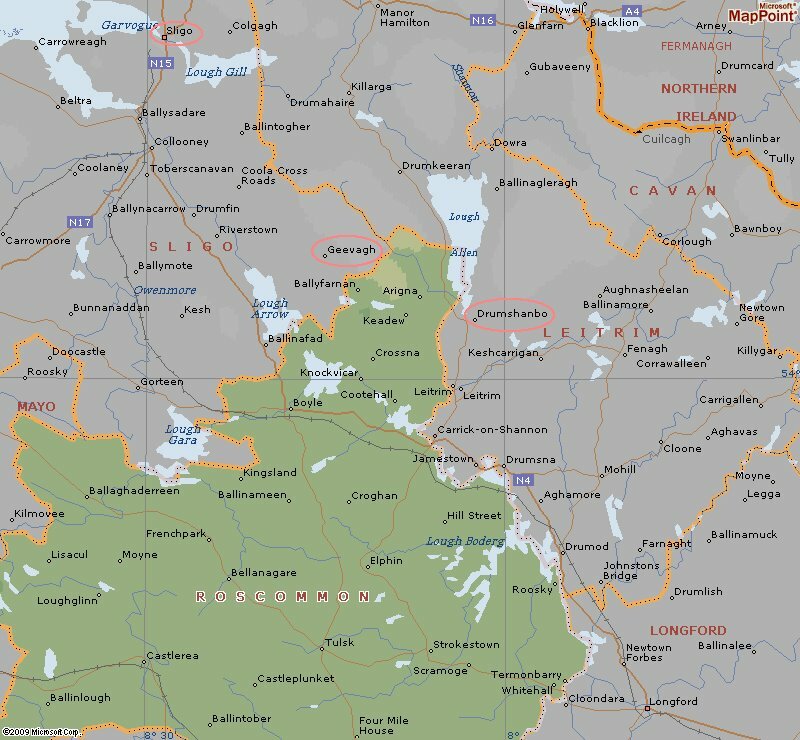 The Roscommon riddle that we need to solve is this - given the information in the postcards, the picture, information from the sign, and locations on the map - can we narrow down a specific location for the farm? As always any additional information or suggestions are welcome either by email or in the comments. 2 Comments Published by Jane on Sunday, May 03, 2009 at 4:33 PM. 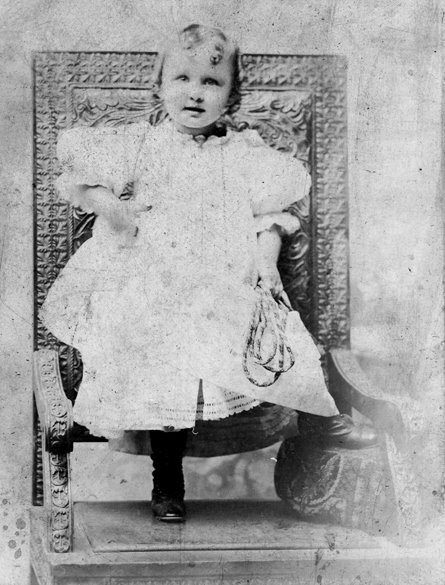 Among the collection of Dowd images, was this photo of Bartholomew McDonough (Father to Mary McDonough Dowd and Uncle to the McDonough children of 1 View Street). 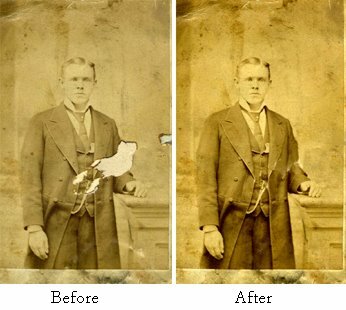 As you can see the original photo was not in the best shape. I spent a few hours today fixing the image to the best of my ability. I wanted to highlight this work to assure anyone out there who has old pictures that are not in perfect condition - these images can be saved! 0 Comments Published by Jane on Saturday, May 02, 2009 at 6:39 PM. My Father and I just returned from a lovely afternoon with Tom and Dianne Dowd. During our visit they shared with us their amazing collection of photographs, newspaper articles and other family history mementos. I brought along my scanner and laptop and set-up "shop" in their dinning room and captured as much as I could. I can't thank Dianne and Tom enough for their generosity in sharing the collection and in their good humor and patience during the hours that we imposed on their hospitality! Here is my first post regarding the material collected today. I have tagged this with both the McDonough tag and a new Dowd_Collection tag to help me stay organized. This was one of the first images Dianne handed me. 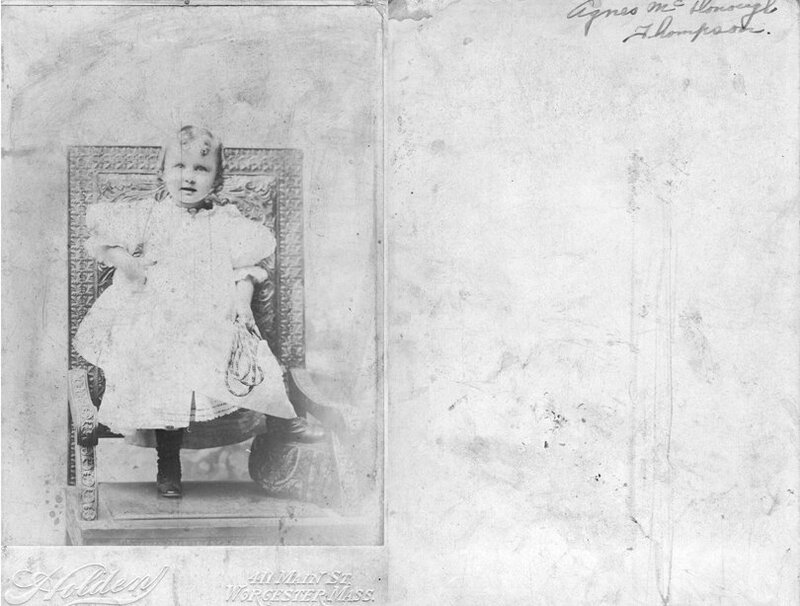 On the back is marked Agnes McDonough Thompson, who was the 8th of the 10 children of Thomas & Mary McDonough and born June 7, 1893. Here she is seen clutching her jump rope and striking a very cute pose. She appears to be about 3 years old. 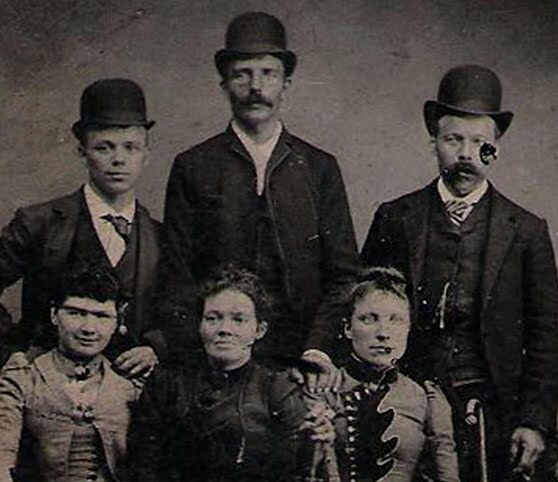 Finding this photo among the Dowd collection of photos provides a clear link that yes - we are definitely connected and belong to the same McDonough family tree.